Two-and-a-half years removed from a five-season run on Showtime’s House of Lies, Don Cheadle barely segues to another rapacious deal-closer in the network’s Black Monday. Rooting interest? Those who admired Michael Douglas’ ruthless Gordon “Greed is Good” Gekko can start building a new shrine to Maurice “Mo The Marauder” Monroe (Cheadle), the coke-imbibing, underling-abusing, womanizing and thoroughly amoral head of a fictional Wall Street firm called The Jammer Group. “I am Black Moses,” he proclaims in an early scene, with his “Promised Land” being supreme wealth and power by any means necessary. No one can accuse Cheadle of not throwing himself into this role. Outfitted with a period piece Afro, he’s a dervish whose whirling is virtually non-stop. Mo’s chariot is a beyond flashy red Lamborghini limousine that takes a beating for starters when a suicidal stockbroker takes a multi-story leap onto its roof. Bad Monday then rewinds to a year earlier, with Mo both snorting lines and spouting them like crazy. Season One consists of 10 half-hour episodes, with the first three made available for review. 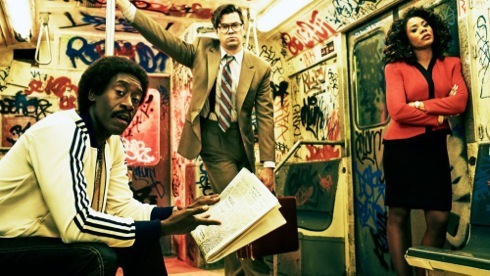 Black Monday’s pace slows somewhat after Sunday’s full throttle premiere. But Mo’s methods remain unchanged. He’s out to screw anyone who can get him to the next rung, whether it’s the twin “Leighman” brothers (both played by Ken Marino) or wide-eyed novice trader Blair Pfaff (Andrew Rannells). He’s lately living with a willful material girl (Casey Wilson as Tiffany) who could be of considerable help in getting Mo majority control of Georgina Jeans. The Jammer Group’s lone woman of import is Dawn Towner (Regina Hall), who yearns to be a partner in the firm while Mo wants only to bed her. The other principal members of his constantly put-upon and put down crew are Keith (Paul Scheer), Yassir (Yassir Lester) and Wayne (Horatio Sanz). They might as well be The Three Stooges. As an actor, Cheadle obviously enjoys this sort of ride. From House of Lies to Black Monday requires little more than a change of wardrobe. The characters of Marty Kaan and Mo Monroe otherwise are cut from the same cloth. And as a second time around for an accomplished actor, it’s all starting to look more than a little threadbare.